Fur Seals were hunted to near extinction during the 1800s. Although no longer in danger they have lost none of the boldness and have very little fear of man. This was my first 'Seal encounter' after spending several minutes among them, this curious female decided to investigate. It came so close that I could photograph the cliff edge reflection in its eyes. 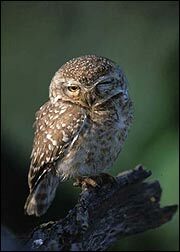 I photographed this Spotted Owlet 'winking at me' on a recent trip to Keoladeo National Park in India. I'm told by many photographers 'Cute sells', so I thought I'd test the theory. Display my work in your home or office. You can chose prints from any of the photographs featured on the web site or from the species list. My photographs are Cibachorme hand printed to exhibition standards. Please see the ORDER FORM for price list & available sizes.